← Trauma recovery? Healing? Integration? Which words communicate a good outcome to you? Most books and stories about child sexual abuse are about female victims. Given the lack of material highlighting the problem of male child sexual abuse, many victims can feel doubly isolated since it seems that no other males experienced abuse. 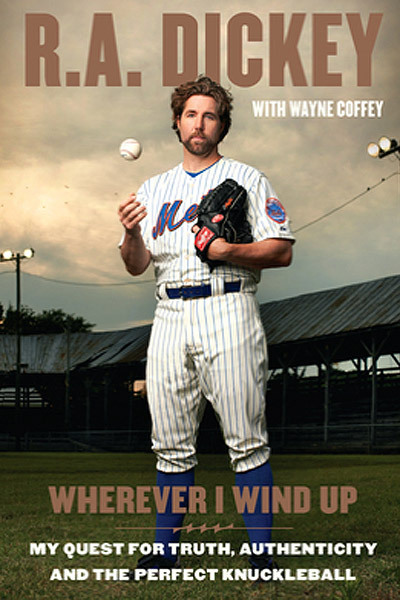 Those looking for a story about male child abuse and rescue might find R.A. Dickey‘s new memoir a good starting point: Wherever I Wind Up: My Quest for Truth, Authenticity, and the Perfect Knuckleball (Blue Rider Press, 2012). R.A. Dickey is on the pitching staff of the NY Mets and in this book details abuse he suffered at age 8 at the hands of a teenage female babysitter and by another neighbor, a 17 year old male. The story is about his struggles growing up, his conversion to Christianity, and his struggles to reach the big leagues after being a very promising first round draft pick. What I like about this book is that it is not a happily ever after story. Yes, many wonderful and good things happen…but so do difficult things. Losing an 800,000 dollar first contract due to an anomaly in his pitching arm, repeated attempts to make it in the big leagues, a miscarriage, the loss of his fastball. Furthermore, he tells the story in such a way that does not promote himself. He doesn’t take himself too seriously and is more than willing to admit his insecurities. Very little is about the actual abuse. He tells a bit about the abuse and how he felt, the smells, the experience (written in the present tense), etc. He also tells about his encounter with the teen girl some years later and the experience he had trying to confront her. If you know someone who would like a realistic read on the struggles of growing up with abuse and other family heartaches and finding one’s way, this might be a good toe in the water kind of book. As a male survivor who struggled to find updated literature acknowledging the reality of male SA, this is quite symbolically meaningful–thanks Phil. Of course, finding integrative material that is theologically savvy for the church…well. Phil, a similar type book I found is Richard Berendzen, Come Here: A Man Overcomes the Tragic Aftermath of Childhood Sexual Abuse (Villard Books, 1993). Richard was the president of American University. If we don’t talk about male survivors, what havoc will occur in the next generation of marriages and families, because it was not adequately faced? Let’s go, Christian leaders! this sounds like a good one to reccomend to men who are just starting on their journey of healing from sexual abuse and are hesitant to go to therapy or seek help (and who also like sports)- so they feel less alone. Thanks Andrew- for reccomending the other book. I have a few people I would like to send these titles to.